The arrival of US military aircraft carrier Harry S. Truman in the Bay of Palma has transformed the organisation of today’s races in a big jigsaw puzzle at the 45 Trofeo Princesa Sofia, in which 1130 sailors from 55 nations are participating, with Olympic medallists and World and continental champions on the way to the Río 2016 Olympics among them. The vessel has anchored in the bay of Palma with a 1.000 metre restriction area in which no boat can sail and a 2.400 meter area in which it is forbidden to stop. The exclusion areas has forced the race committee to move the Laser racing course and reduce the length of the windsurfing course where competitors will sail two laps of a shorter course. 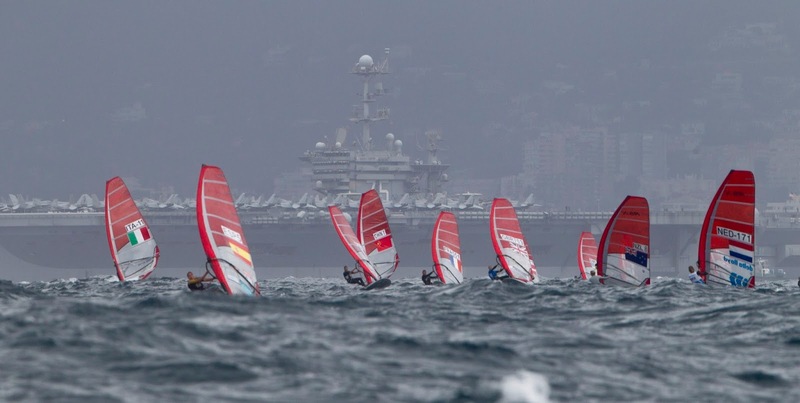 Organisers were informed last week that the aircraft carrier would arrive today and were forced to make changes to the seven racing areas on the Bay of Palma. The boat will be anchored in Palma until Sunday and will affect the regatta today and tomorrow. The Medal Races scheduled for Saturday, the final day will determine the podium places. These decisive races will be sailed in three race course areas closer to shore. With almost 6.000 US military personnel aboard, the Harry S. Truman is 332,8 meter long and 40,8 wide in the water line, although its maximum beam on deck in 78 metres. With 25.958 square metre capacity in the flight deck, the vessel could carry four full fleets of the Princesa Sofia, whose 803 boats (ten Olympic classes and one Paralympic class) would occupy 6.510 square metres if placed one next to the other. With almost 1.200 sailors representing 55 nations, the Trofeo Princesa Sofia is the Spanish event with the highest number of entries. It is the fourth stage of the ISAF Sailing World Cup, the prestigious Olympic World Cup that has already visited Qingdao (China), Melbourne (Australia) and Miami (United States). The last event of the circuit is Hyères (France) at the end of April.